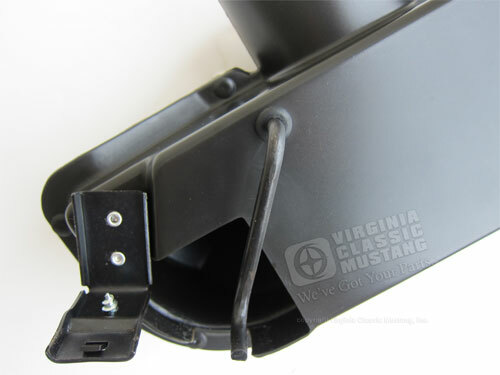 With the nasty weather here at Virginia Classic Mustang, I thought it would be a good time to talk about Heater Plenums. Just about every 65-68 Mustang needs a new Heater Plenum. The original plenums were constructed of a pressed board material that just cannot hold up over a long period of time. Original heater plenums are usually torn and warped from water/antifreeze damage. This Plenum directs the air flow to either the defroster hose to the windshield or to the floor. 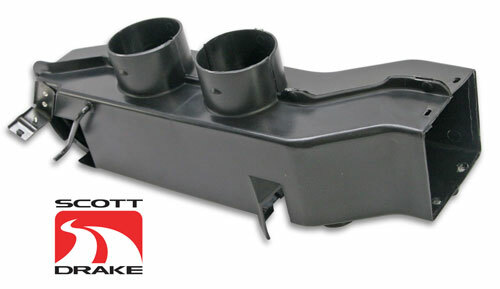 The Mustang Heater Plenums that we handle are molded from ABS plastic. They come in a dark gray color to replicate the color of the original cardboard plenum. They feature the correct bracket, grommets for the flapper door rod, and a metal flapper door with pads. They are a tremendous improvement over the original cardboard Heater Plenum. The price is also incredibly reasonable. Order our part number IN-546. While you are replacing the heater plenum, it is always a good idea to replace the Heater Foam inside the larger heater box that houses the Heater Core. Don't forget our 10% Discount Coupon Code. There is still some time left to save on those Mustang Parts that you didn't get for Christmas. Also don't forget to "like" Virginia Classic Mustang on Facebook! I love this, so I've been posting it for the past couple of years. I found it somewhere on the internet and tweaked it a bit. I don't know the author (sorry), but it is pretty cool! 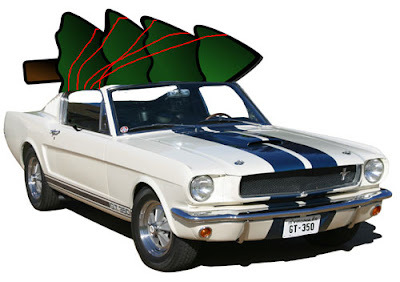 Happy Holidays from Virginia Classic Mustang! There wasn't a trace of a Chevy or a Dodge. So I figured I'd mess with the ‘Stang for a bit. When a deep voice behind me said "looks pretty good." And there, by the workbench, stood good ol’ Saint Nick! Then he said "don't suppose that you'd trade for my sleigh? "But if you've got the time we could go for a spin!" Turned into a smile and he said "hey! Let's go!!" I turned on the key and I let the clutch spill. But he liked it a lot, by the look in his eyes. We headed on out where the hot rodders go. With every up shift, as I went through the gears. So I backed off the gas and said "you wanna drive?" When he walked past the headlights he shook at the knees! Then the HiPo exploded with side exhaust sound! Santa let out the clutch and the tires shook the ground! Power shift into second, again into third! "Merry Christmas to all...........what a great night!!!" Woodgrain Inserts for 65-66 Mustang Consoles - NEW! 1965 and 1966 Mustang Wood Grain Insert Set for Console. Here at Virginia Classic Mustang we are pleased to announce that we now have 1965 and 1966 Mustang Woodgrain Inserts for the Consoles. These are the super nice metal inserts, not the contact paper style, so there will be no problem with durability or shrinkage. We had these years ago, and always get calls asking when they may be able again. They are now in stock!! We have two versions available. Part number IN-1569 is for the Automatic Transmission and Part number IN-1568 is for the Manual Transmission. 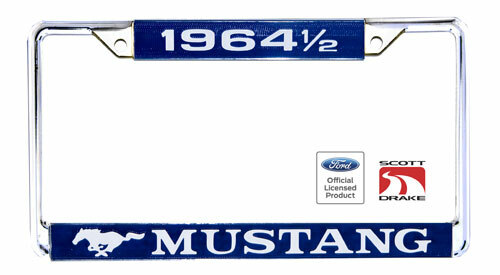 Mustang License Plate Frames - Now in Stock! It has been a while since we have had Mustang License Plate Frames in stock. We are very pleased to announce that we have them again!! They are available for all years from 1964 1/2 - 73. They all feature the year designation along with the running horse and the word "MUSTANG". The frames are nice die cast metal with chrome plating and blue inserts with white lettering. 1965 Mustang Day/Nite Inside Rearview Mirror. 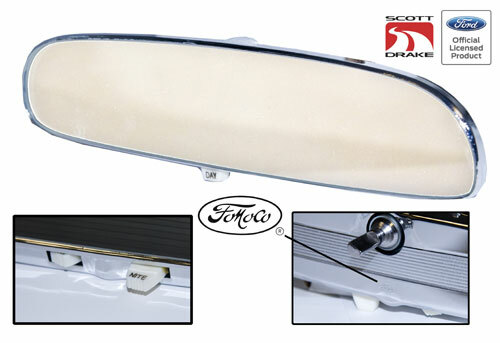 The brand new, show quality '65 and '66 Mustang Day/Nite Inside Rearview Mirrors are now in stock. These mirrors are a great improvement over the previous reproductions. Both feature the FoMoCo® stamped logo and the correct argent painted ribbing. The 1965 Mustang version has the rocker style switch like the original. The "buttons" for the rockers feature stamped in "DAY" and "NITE" words like the original mirror. 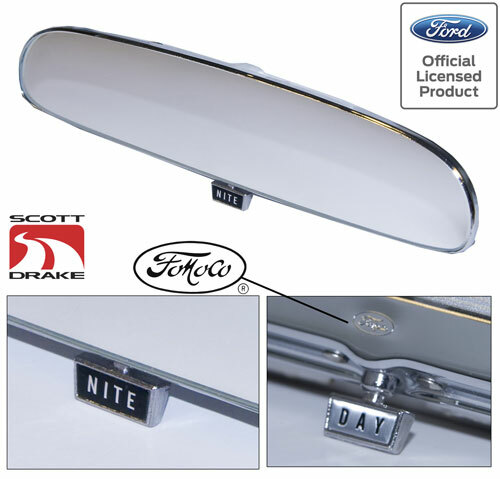 The 1966 Mustang mirror features the correct twist style knob also, of course, with the "DAY" and "NITE" words. Both are, of course, Ford Licensed Products. 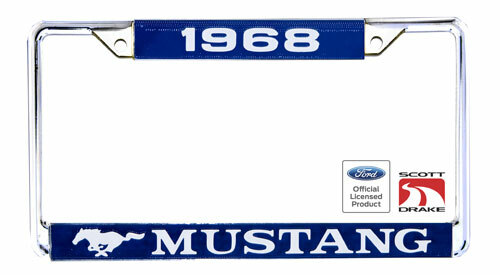 The 1965 Mustang Mirror part number is IN-6171, and the 1966 version is IN-6181. We also still have the cheaper versions of these mirrors. 1966 Mustang Day/Nite Inside Rearview Mirror. 10% Discount at Virginia Classic Mustang!!!!!! Happy Holidays from your source for quality 1964½-73 Mustang Parts and Accessories for over 30 years! Get 10% off* your next online order with Virginia Classic Mustang. Log onto our web site by clicking above logo or clicking here (new customers will need to register), fill your shopping cart, and proceed to checkout. During the checkout process, enter the coupon code below and click "APPLY" for your 10% Savings*! *Code Discount does not include 65-67 Styled Steel Wheels and select other wheels, Wheel and Tire Packages, Gift Certificates or E-Book Downloads. This code only applies to online orders. Expires December 31, 2012. 1970 Mustang and Ford 351C Thermostat Housing. We now have a very nice reproduction of the original 351 Cleveland engine thermostat housing. It is our part number EG1772. Like our other thermostat housings, this part is cast in high quality aluminum like the original. 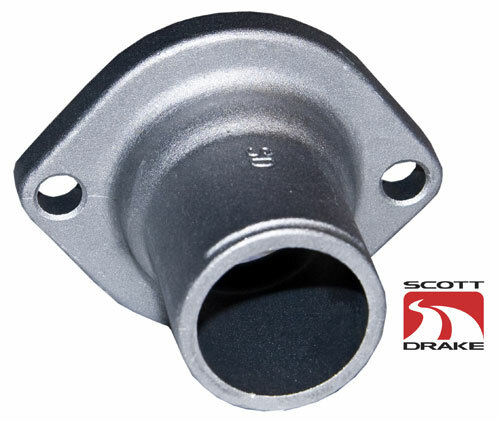 See our complete listing of Mustang and Ford thermostat housings by clicking here. The body and all parts are now painted on this '65 Mustang Convertible. Hopefully you have been following along with the restoration of the 1965 Mustang Convertible at Maple Hill Restoration. The response from our Blog readers on this project has been great, so we can't wait to post more pictures as this beautiful Mustang goes back together. Oh, by the way, the color is Twilight Turquoise. Jeremy duplicated the factory paint line on this January '65 Dearborn produced Mustang. 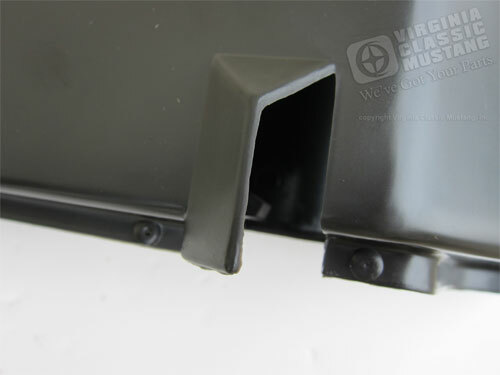 Black out on the Mustang rocker panel has been duplicated as original. Black out on the Mustang bottom quarter lip has been duplicated as original. Factory markings as originally found where reapplied to the radiator support area on the Mustang. Factory markings as originally found where reapplied on the Mustang. The paint finish on this Mustang is absolutely amazing. The Mustang's rear wheel house sealer/sound deadening was also duplicated like the original. Jeremy even duplicated the factory primer/sealer here on the inside which will never be seen. More parts will be added to this Mustang soon! Gas tank has been installed in the beautifully painted trunk. The level of detail is amazing. Here you can see how Jeremy duplicated the original grey primer/sealer on the back trunk brace of the Mustang. More detail on the Mustang from underneath. More detail on the Mustang from the engine compartment area. More detail on the Mustang from the LH frame rail area. All factory sealer was also carefully duplicated. This is a great new book that just arrived. It is the High Performance Ford Engine Parts Interchange Book. Our part number is LT-185. Lots of part and casting identification numbers are listed to make this a very handy reference book. 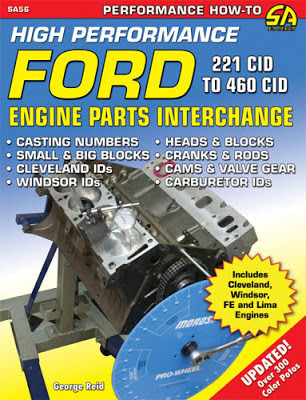 Thoroughly researched, High-Performance Ford Parts Interchange includes critical information on Ford's greatest V-8 engines and goes into great detail on the highly desirable high-performance hardware produced throughout the '60s ,'70s and '80s. By combining some of the best parts from various years, some great performance potential can be unlocked in ways Ford never offered to the general public. Following the advice in High Performance Ford Parts Interchange, these engine combinations can become reality. You will find valuable information on cranks, blocks, heads, cams, pulleys, intakes, rods, pistons, and even accessories to guide you through your project. 1965 Mustang Convertible Body has been painted. Hopefully you have been following along with the restoration of the 1965 Mustang Convertible at Maple Hill Restoration. The body and parts are now painted, and we will be posting more pictures as Jeremy at Maple Hill Restoration puts this nice Mustang back together. Mustang Rear Valance and other parts were painted separately. Mustang hood, fenders, and other parts were painted separately. Mustang fenders prepared to be painted separately. Mustang Trunk Lid prepared for paint. Mustang door prepared for paint. Mustang head light door painted separately. Mustang hood and fender painted separately. Both Mustang fenders ready to go. 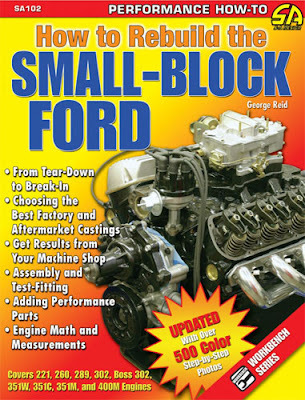 How To Rebuild the Small Block Ford Engine Book. This informative book gives you helpful hints and tips on performance upgrades, including cams, heads, ignition, induction, and more. It also points out problem areas to watch for, professional builder tips, jobs that need special care or special tools, and more. Whether you're a first-time engine builder or seasoned professional, this is the essential guide to rebuilding your small block Ford. 144 pages and over 500 photos. Our part number is LT184. 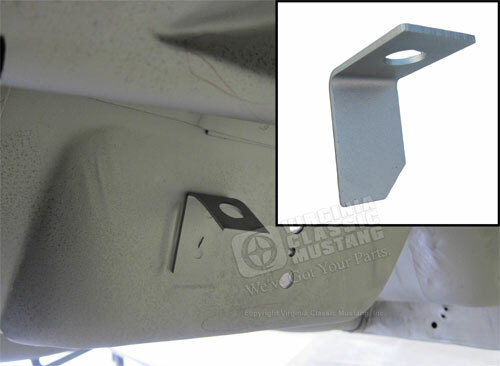 We now have the rear brake hose bracket for the 1965 and 1966 Mustang and Shelbys equipped with factory dual exhaust. This bracket is made just like the original from heavy gauge steel. 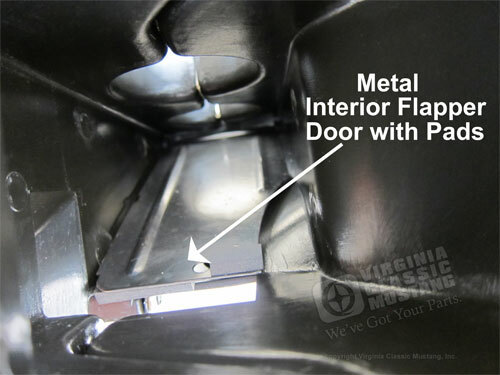 It welds to the floor pan as shown in the image above. The factory dual exhaust equipped Mustangs used the BK112 Rear Brake Hose and this bracket was used to re-locate the inlet of the hose. Our part number is BK1121. Original 289 High Performance air cleaner decal on a '66 GT350H Shelby. Every October the Lehigh Valley Pennsylvania Region of the Shelby American Automobile Club hosts their annual NE SAAC Regional Meet in Harrisburg and Hershey, PA. The meet is always great and features a Friday evening social, a Saturday breakfast, road tour, lunch at Bill Collin's (BC Fords) shop, a Saturday evening program, and a Sunday car show at the AACA Museum. If you have not attended, you really should make plans to do so next October. It is a great place to meet up with your old and new Shelby friends. This is part three of our images from the event. The pictures here are from the car show held on the last day of the event at the AACA Museum in Hershey, PA. I had so many up-close, detail shots that I don't really have many images of the complete cars! Anyway, enjoy the pictures! Original Shelby American step plate label on a '66 GT350H Shelby. There were an impressive number of 1966 GT350 Shelbys at the show. Nice original 1966 GT350H Shelby. How about four (yes four) Boss 429's? Another 70 Boss 302 with the 429's.